Long Island Tutoring Service provides affordable tutoring to students of all ages and grade levels. We offer test prep services, tutoring in all subjects, remediation of reading difficulties, and homeschool services. Tutoring sessions can be private, in small groups, or in small classes. We will be giving away a seat in one of our upcoming SAT prep classes. 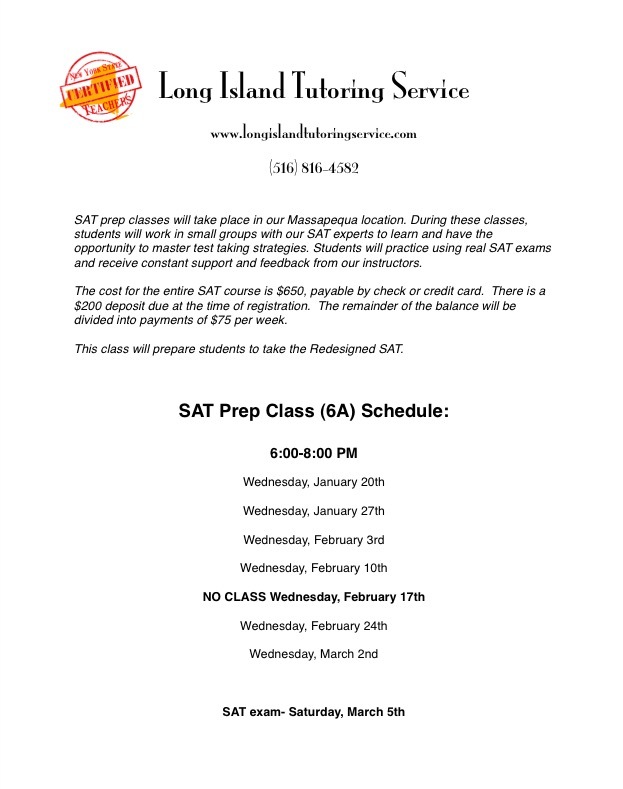 The class meets in our Massapequa location and runs from January through March. This class will prepare students to take the first administration of the Redesigned SAT on March 5th. The classes will focus on improving the student’s reading, writing, and math skills for the SAT exam. In addition, students will work with our SAT experts to learn and have the opportunity to master test taking strategies.